This topic contains 12 replies, has 5 voices, and was last updated by General Slade 2 weeks ago. I’m trying to find some decent piccys to help me paint a 28mm French Voltigeur Officer, how hard can it be, you might well ask? In short, for me, very! Depends if he’s intended for early Napoleonic days or for 1815? Oh, thanks for that… the thick plottens! I’m afraid the plot thickens further because in the French army both the line and light infantry had voltigeur companies and they wore different uniforms. So you need to know whether you are painting a line infantry voltiguer officer or a light/légère voltigeur officer. Just click on the ‘Uniformes’ link and then on the tab for the Voltiguer company. One thing to note is that in 1808 the national cockade, worn on the shako beneath the plume or pom-pom, would have been blue, within red, within white (rather than the blue, within white, within red worn by 1815). If your figure is modeled wearing a plume then it is likely to be white whether for a line or light infantry regiment. If your figure is wearing cords and flounders on the shako then they would be gold for a line officer and silver for a light officer. The same is true of the boot tassels if your guy is wearing Hessian/hussar-style boots. The good thing is there were lots of variations so as long as you get the basic uniform right people would have a hard time proving that you had got any of the details wrong. Thanks for that… I think! Welcome to the wonderful world of Napoleonic uniforms! I found this picture of a Line voltigeur officer. The colour of the plume is, I think, unusual for an officer, and the piping on the collar would generally be blue but as I said there weren’t really any hard and fast rules (and where there were rules they often seem to have been ignored). My dear General, thanks for your help, that poncy looking chap will do perfectly! I’m no big fan of the Frenchies and the Occifer will be taking part (hopefully as a mark for Daniel Hagman!) in our Fistful of Lead Harpe and Sharper games… so, long as he looks a gaudy ploomed nobber, job’s a good ‘un! Glad to be of service Harry. I look forward to reading the battle report and hearing how our brave lads make the lily-livered Frenchies run like rabbits. Wot GS said. The Osprey MAA books on French Line and Light Infantry are actually pretty good for listing the many and various variations of elite company distinctions and drummers’ uniforms. He may even avoid such a fate if he helps the Rifles to fight against a bunch of deserters and /or some evil sergeant, depending on your scenarios. Poncy looking chap? Poncy!? That getup is positively demure and understated by Napoleonic standards! I’m not much of a fan of the Frenchies and have made a bit of a pig’s ear of painting the uniform, but this is FFofL land, so I’ve gone for a generic looking Froggy light Infantry Occifer as as Sharpey’s nemesis. As I was painting Captain Marcel le Tosspot I was certain that the pointing bloke was him. The other fellow’s dark blue looked crap all in one colour, then I put the detail on, and he sort of started to grow on me… kind of sinister. Then I thought all the classic baddies wear dark colours! any suggestions from the Brethren? I think the light infantry officer in all dark blue makes for a good baddie. He has a certain hauteur that gives him a je ne sais quoi. 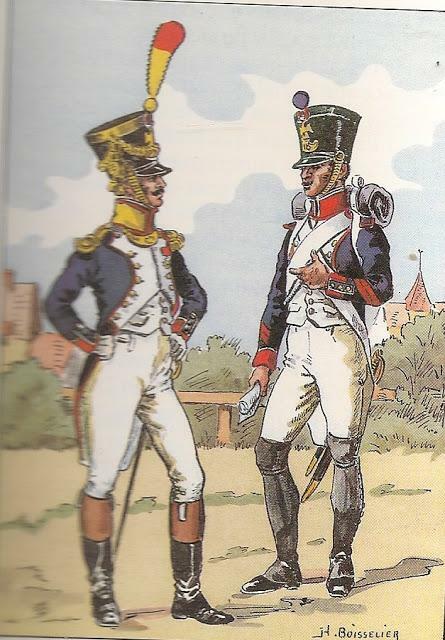 Plus, if we are going to be picky – and since we are talking about Napoleonics we really ought to be – the bleu of the coat of the chap on the right looks a bit more Bavarian than French to moi.